The Department of Horticulture offers graduate work leading to the Master of Science and the Doctor of Philosophy degrees. Active teaching and research programs are being conducted in ornamental horticulture, floriculture, fruits, vegetables, and nut crops. Students can focus on areas of specialization that include plant breeding, physiology, plant development, biotechnology, postharvest physiology, nutrition, biochemistry, integrated pest management, weed control, water relations, crop production and management, and product utilization. The department has about 40 full-time faculty members located at the Athens, Tifton and Griffin campuses, and various other locations in the state. The facilities available for graduate training include three well-equipped Experiment stations, the State Botanical Garden, and several field research centers that represent the climatic areas of the state. The department has strong interdisciplinary research programs with other departments in the University. Cooperative work is available with three federal research laboratories. The Department of Horticulture consists of four units: a teaching/research unit located on the main campus in Athens, research unit located at the Georgia Station in Griffin and the Coastal Plain Station in Tifton, and and extension unit with faculty in Athens, Griffin, Tifton, and Bryon Ga. The Department of Horticulture offers undergraduate majors in Horticulture and Landscape and Grounds Management. Within the Horticulture major, a student may select to concentrate in fruits/vegetables, turf management, ornamentals, or on a graduate school option. The department also offers a minor in horticulture which is awarded following the successful completion of 27 hours of horticultural courses. 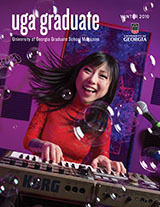 The graduate program offers programs of study which lead to the M.S. or Ph.D. degrees. Georgia horticultural scientists use modern equipment and techniques to serve the fastest growing agricultural commodity in the state and nation. Georgia is the “Peach State,” as peach-growing technology evolved in the state during the early 1900s. Scientists conduct cultivar, pruning, root restriction, and cold hardiness studies to maintain Georgia’s ranking as the number two U.S. producer. Georgia’s pecan industry leads the United States and the world in production. In the last 30 years, University of Georgia scientists have prompted a 50 percent increase in yield of pecans by furthering the understanding of the alternate-bearing habit and nutritional needs of pecan. The value of the Georgia Vidalia sweet onion crop has doubled since the late 1980s. The new capability to store excess supply in controlled atmospheric storage, as discovered by our scientists, enables growers to store excess production and maintain stable prices. Cultural, biochemical, and genetic control of the characteristic flavor of Vidalia onions is currently being studied. A two thousand percent increase in the value of the tomato crop in Georgia in the 1980s indicates the growth of the vegetable industry in the state. Current research is examining methods to control pests biologically, increase the stress tolerance of transplants, and increase cropping efficiency. The ornamental horticulture industry is forecasted to be a billion dollar industry in Georgia by the year 2000. The growth of Atlanta, site of the 1996 Summer Olympics, has catalyzed the growth of the industry. Georgia scientists maintain their national leadership role in new pot, cut flower, and landscape plant selection, propagation, and production research.